Two new episodes of Daebak drama this week; the end will come soon. A lot of changes and twist in these episodes. We are still in shock and have a lot of questions. Let's start the review now. Esther: Hi, Sheryl, are you still crying!? I am, but the show must go on. Sheryl is the guest this time, she is from Philippines and call me mom since we met years ago, eels bonds. Welcome Sheryl. SHERYL: Hi there, ladies! Thank you for this opportunity to share my thoughts on this episode. Before I got the invitation to join the conversation for this episode's review, I had decided not to watch for a while because I am nervous and afraid of the twists in the story. Thanks to Mom Esther for her encouraging words…. Well, let's begin. Esther: Beth will not be here with us this time either. After her trip, she has to catch up on things at her work. ESTHER: Yes Sheryl, I agree with you. All you said is right. It’s incredible that kind of behaviour. ESTHER: And so, the king is still sick. He can't walk and only barely manages to talk. He asks Chae Gun who stopped him from killing In Jwa. Oh Nooooo!!! He suspects his own sons,Yeoning and Daegil. But to his relief, the master tells him that Dam Seo sacrificed her life for Lee In Jwa. Chae Gun blames himself and asks to punished for the failed mission. Waaa!?! Please, Sukjong, don't punish him. It wasn't his fault. Dam Seo killed herself on Chae Gun’s sword. SHERYL: Yes, it was really Dam Seo' s choice to take the sharp edge of the sword in exchange for Lee In Jwa's death. What a waste of life. And because of that, the King realizes how bad it is to have an ill-fated relationship with Lee In Jwa and wonders how it will end. SHERYL: Meanwhile, an extremely angry Lee In Jwa goes to Prince Yeonryeong and kills him with his Moo Myong’s sword, in revenge against the King for Dam Seo’s death. He wants to show the King how painful it is to lose a child. His right hand man, Moo Myung, is surprised and confused. Even so, he still follows his master’s order to get a coffin and meet the Shaman. Aah! My most hated character in this drama ever, Lee In Jwa! He is getting on my nerves. Even those poor servants who witnessed the death of their young master do not escape his atrocious plan and hesitantly follow what this evil man orders them to do because they fear for their lives. ESTHER: Now they are even. They both lost a child. In Jwa loses his adopted daughter, and the King, his youngest son. The same struggle. This is very sad; both are miserable. Where are those people in the palace when In Jwa arrives? How come no one notices him? They finally come, but it is too late. Poor young prince. As planned, In jwa indirectly give instructions to the shaman to meet the ministers and send them to the crime scene. What happened? Does he own the palace now? The ministers are in shock and think Yeoning killed his brother. ESTHER: Yeoning is drinking alone and Dae Gil comes. He is crying because everyone he loves died: his mother and Dam Seo. Please, Yeoning, Dae Gil feels the same way too. Both of you are grieving, He also loved Dam Seo and your mother. In fact, it is more difficult for Dae Gil because he barely experienced a motherly love from his mother, so don't be selfish. Aah! I cried with him more because he helped you and acted like he was strong in front of you. But no, his weak side reaches its limit this time. He is sadder than you...he never had a mother which you had. SHERYL: This upsets me. Baek Dae Gil blames himself for not protecting his love, but Chae Gun comforts him. Yes, he is correct. Hush! Hush! Dae Gil-ah, my poor Dae Gil. You already did what you needed to do. Dam Seo had a different idealism and chose a different path; that is why you and she could not meet. ESTHER: For the murder case, the ministers fabricate the cause of death of the young prince into indigestion. A bunch of liars!!! Who would believe that? He was very healthy. Sudden death is really questionable. But the influential people in the palace join hands together to hide the truth behind the incident, including the Crown Prince and Prince Yeoning. Their reason is to stabilize politics so the people will not become divided. And also to protect the the standing of Prince Yeoning. This so unfair! Human nature is dangerous sometimes. Selfish people. SHERYL: And news already is spreading in the city, enough for the people to be stirred up and worried. By the way, the dead prince lived his life humbly. He donated his land and assets to people and barely managed to keep three slaves in his house. This maybe is the reason why Lee In Jwa went in and killed the prince very easily. During his funeral, all his donations are confiscated by the unknown people. Tsk! Tsk! In the end, the poor people are the ones who suffer most because of the interests of a few. ESTHER: Ahh...the injustice of this life.This time, Lee In Jwa is plotting to kill the King. What? He didn't notice that the king is very sick? Thanks to rebel Jeong for coming in and interfering. He makes a deal with Lee In Jwa. They accept each other as allies and seal it with blood oath. They sign the oath with the bloodied palms of their hands. That was very scary! SHERYL: Then a new character is revealed, under the name of Park Pil Hyun. He’s another ally of Lee In Jwa. His role is not yet revealed. What it would be? Will Lee In Jwa get caught this time, and will Park Pil Hyun continue what In Jwa started? My wild imagination! Hahaha!!! ESTHER: Well, I am curious too. I think you are not so far from the truth. Maybe he will be In Jwa’s successor. In the palace, people are still mourning. While Yeoning is rationalizing his judgement regarding the incident, Yi In Jwa comes in and reveals the true identity of Baek Dae Gil's birth father, the King. From then on, Yeoning starts to doubt the sincerity of Dae Gil. He suspects that his brother also desires the throne. Bad...bad…. Bad attitude, Yeoning. SHERYL: Well, Mom, we cannot blame Yeoning. He grew up in an environment with full of influences and deceptions. Liars, greedy and selfish people all around him made him that way. On the other hand, Daegil meets the rebel leader. Jeong recites the reason why he had to be a rebel and why Lee In Jwa had to kill the young prince. It is all because of dirty politics and the throne. Well, Daegil discovers that the rebel and In Jwa were the ones who confiscated the rations from the people, and that all the havoc had happened in the neighbourhood is due to them only. ESTHER: Yes, Sheryl, our very smart Daegil pretends to be one of them in order to arrest the rebels. It is well acted though. I never thought about that plot twist, and maybe many viewers, too, were surprised by the conclusion. Well planned and coordinated, with Chae Gun, Prince Yeoning, and the people. Finally, the rebel gets caught through the efforts of our hero, Baek Daegil! Baek Dagil! Baek Daegil!!! SHERYL: Hahaha! Our hero! Bring it on, Baek Daegil !! Once again, he gains attention from the people. They cheer and praise his heroism. Yes! Can I cheer too!?! Bravo, Baek Daegil! Work well done, my love! Yeoning, on the other hand, is just observing the situation. We don't know what he is thinking, but bitterness and doubt are painted on his face. ESTHER: He is jealous of Daegil, Sheryl. I saw it in his eyes. Finally, the brothers find the poisonous medicine in the office of the rebel Jeong. It’s the opium the King inhaled which caused his deteriorating health. This is valid proof of his crime. When Jeong is sent to jail, Lee In Jwa becomes restless because of their missing blood oath. Sheryl, you might be very happy…. SHERYL: Oh yeah! I am very happy...that stone face! I can see fear. I can sense the end of Lee In Jwa is coming! Hahaha! Anyway, let’s get back to the story. Prince Yeoning reports to his father that Baek Dae Gil arrested the most-wanted rebel Jeong. The king is happy about the news and summons his estranged son. Oh! 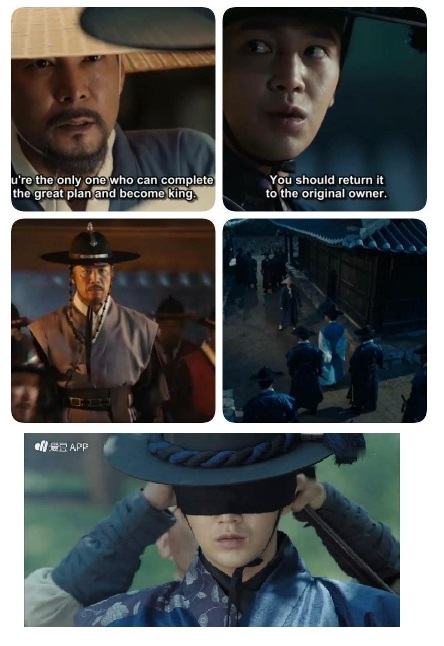 My tears are flowing when the king calls him Yeong Soo-ah…. It is a really touching moment when the father acknowledges his son. I wish they had hugged each other or, at least, held hands. Well, it’s too late to show some intimate affection now. 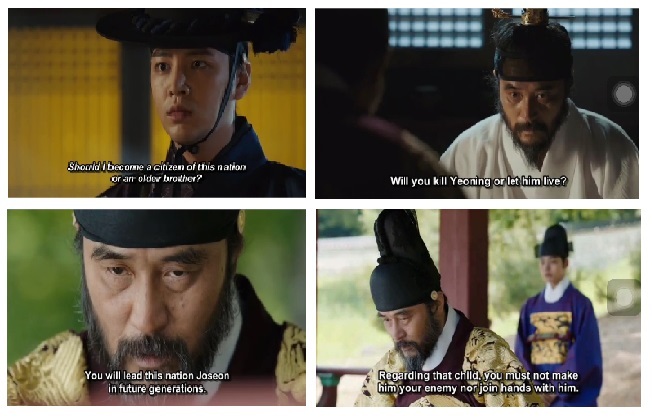 The father-son relationship is already given up, since the king decides to leave Prince Yeong Soo alone. ESTHER: Wow, I heard the name too, and my heart was beating very fast when i saw Daegil’s facial expression. I don't blame him for not wanting to be with the king. I am adopted and, when i met my real parents, I really didn't feel anything, as if it was nothing. Until now, I still can’t see them as my real parents. SHERYL: Oh! That is so sad, Mom. We cannot choose the parents who bore us. That is the fact. I hope someday all is well with you and your real parents, just like Dae Gil. Finally, he was acknowledged, face to face, by his father. No matter what happened in the past, I believe that he had a soft spot in his father’s heart because, even if he was cast away from the palace (again due to the politics and the suspicious and vicious people in the palace) when he was still an infant, the King was always aware and on the watch for Baek Dae Gil’s whereabouts. ESTHER: Oh! The Strong Man, the Tiger whom Lee In Jwa feared the most, is gone. The King finally met his creator. That was sad…but before he dies, the king speaks with the Crown Prince about his succession to the throne. The King asks him what his plans are for his brother Yeoning! 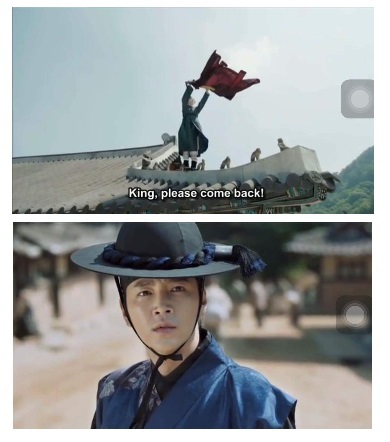 If he will going to kill or leave Yeoning alive, because he surely is a threat to the Crown Prince when he becomes king. The King wants to prepare the two brothers for their positions before he leaves them. But the Crown Prince’s answer is not disclosed in this episode. We all know that he is self-centered, an idiot, his philosophy is against the norms, and, worst of all, he is manipulated by Lee In Jwa. Who knows what he is going to do. Yeoning’s position, on the other hand, is safe. The King promised him that someday he will sit in the throne. The only thing he has to do is take good care of himself. The King also told Yeoning “not to be an enemy of Daegil or unite with him” because they have different fates. I hope he will obey his father. SHERYL: The King might have felt that his time is coming near. So, he talked to his three children, one by one. He spoke his heart to them. As for Daegil, he asks him to be a hyung (older brother) to his brother, Yeoning. Hopefully, Daegil will follow his father’s wish. I love that the two brothers get along so well. To the Crown Prince, the King wanted to know his heart, that is why he asks what Yeoning’s future will be, from his hands. And to Yeoning, he tells him that he will make it sure his position will be settled before he goes. He promises Yeoning that someday he will surely sit in the throne. Only he has to take good care of his health and watch over his life. Hmm.... I will tag Yeoning as “Father’s favorite son”. It is very obvious that Prince Yeoning earned more love from their father, in comparison to his siblings. Esther: Oh, when King Sukjong died I felt so sad. I am mourning, too, because I admired him and followed his wise words since the beginning of the drama. Daegil hears the news in the street. I want to know how he is feeling now. Esther: Thanks, Sheryl, for being here with me. I can't wait for the next episode. Sheryl: You are always welcome mom...I always love to be your rescuer. LOL! SEE YOU NEXT TIME!! !